August 14, 2012 in "astrophysics", "japan"
"Look." I stood at the boundary between two areas in the Faculty of Science. 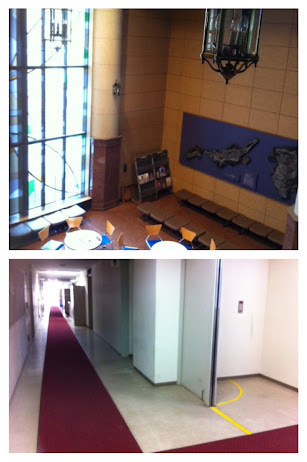 In front of me was the building's foyer with rooms leading off for the office staff and mail room. Behind me was the ground floor of one of the adjoining twin towers; an 11 storied building containing physics and chemistry laboratories. My own office was on floor 9. The foyer area was sparkling clean; gleaming floor tiles in a peachy marbled design reflected the attractive ceiling lamps and white washed walls. A central stained glass window depicting symbols of Hokkaido University splashed coloured patches of light across a collection of tables and chairs. In the tower, a bulb in the dimly lit corridor crackled and went out. "Why don't they clean past here?" I asked. "We get grimy grey flooring with foot deep grit embedded in each corner and there is clearly the ability to keep it nice!" "It's because there are experimentalists here." I was told. "It's not worth it." Theory needs a new building.